"Simple, rich, and mildly spicy dish of black-eyed peas served in flour tortillas." Heat the olive oil in a medium skillet over medium heat, and cook the onion until tender. Mix in the black-eyed peas, vegetable stock, jalapeno, garlic, and lime juice. Season with salt and pepper to taste, and continue cooking until heated through. Wrap the mixture in the tortillas to serve. 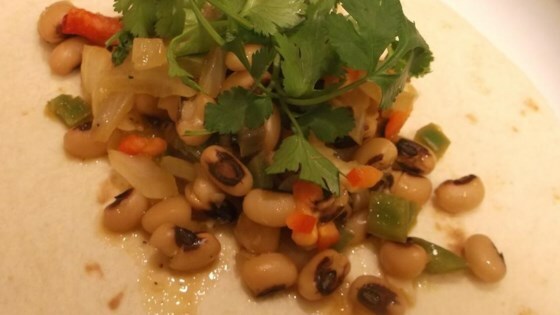 Make flavorful, Mexican-inspired black-eyed peas in the slow cooker. This is my husband's favorite vegetarian recipe! We have it once a week. We sometimes add homemade salsa to the mixture in the tortilla for more zing. Great recipe!! Simple, great recipe. I added an extra clove of garlic and omitted the vegetable stock. I think any stock would make this too liquidy. Serve with shredded cheese and sour cream. This is a great and very tasty recipe, but I'm not sure how they can claim this serves 4. It was barely enough to fill 3 tortillas. I recommend at least doubling the recipe. This was good with scrambled eggs, salsa and cheese, made a breakfast burrito! YUM! Excellent recipe. Tasted great. My picky husband enjoyed it. I omitted the stock (there really isnt a need for it). I added extra cheese. DELICIOUS!! !